Set close to Camp Nou stadium and moments from Collblanc Metro station, Madanis Apartments Barcelona is an ideal base for visiting the city, whether you’re travelling as a couple or as a family. The apartment sizes are split between three person and five person spaces – both featuring private bathrooms and kitchenettes and the large apartments also including a living room. All spaces have LCD TVs and free wi-fi access, which are ideal for unwinding after a day spent exploring Barcelona. When you stay at Ona Living Barcelona in L'Hospitalet de Llobregat, you'll be in the business district, a 3-minute drive from Fira Barcelona and 5 minutes from Placa d'Espanya. 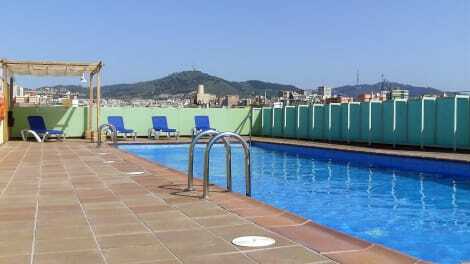 This apartment is 2 mi (3.2 km) from Poble Espanyol and 2.5 mi (4 km) from Camp Nou. Encompassing 50 modern and spacious apartments in L'Hospitalet de Llobregat, Aura Park Sud Apartments provides bright, stylish accommodation within 15 minutes of Barcelona by train. The apartments come with fully equipped kitchens and private bathrooms as well as air conditioning, free wi-fi and LCD TVs. Guests also have access to the rooftop pool, which boasts panoramic views of the surrounding area.